I’m excited to share one of my favorite treats with you, no bake crumble topping! 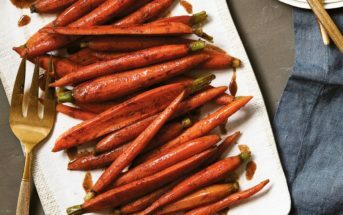 The recipe is a preview from the Go Dairy Free 2nd Edition. I simply love crisps, but sometimes I don’t want to deal with baking. So I whip up this raw, grain-free topping for dairy-free ice cream, fresh fruit, and in this case, to make a peach crisp yogurt parfait! The idea to share this particular recipe when Silk asked me to whip up a recipe for #TopItTuesday using their new AlmondMilk Yogurt. It contains 5 to 6 grams of protein from pure, creamy almond butter, and comes in Vanilla, Peach, Strawberry, Plain, and Dark Chocolate Coconut. 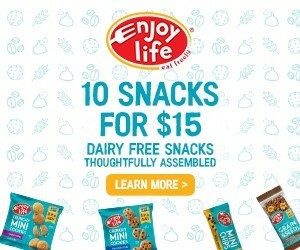 Unfortunately, their AlmondMilk Yogurt is apparently so awesome that my local stores can’t keep it in stock! 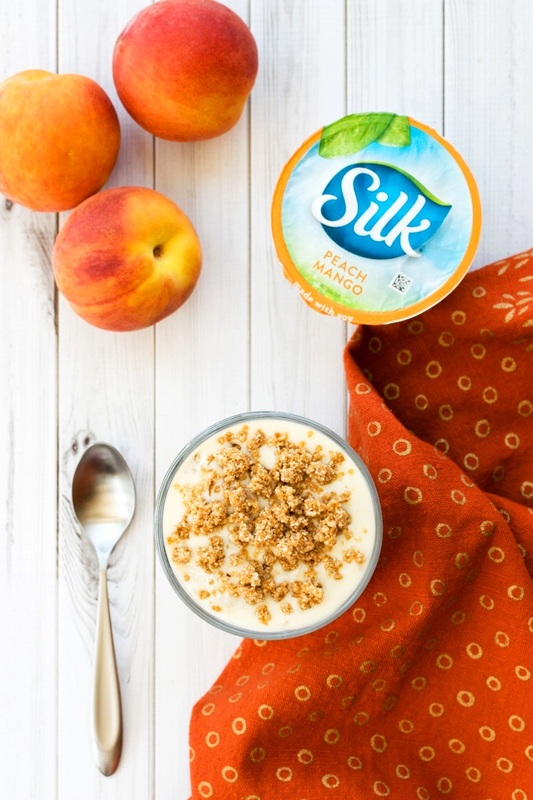 However, Smith’s (a Kroger store) did have Silk’s Non-GMO Verified Soy Yogurt Alternative available, which meant the peach crisp yogurt parfaits were on! I found the dairy-free yogurt alternatives on the top shelf in the dairy section at Smith’s. Do you see that gaping hole in the photo above? That’s where the AlmondMilk Yogurt will be returning to! See the Silk store locator to find out where to buy the AlmondMilk Yogurt and the Soy Yogurt Alternatives. 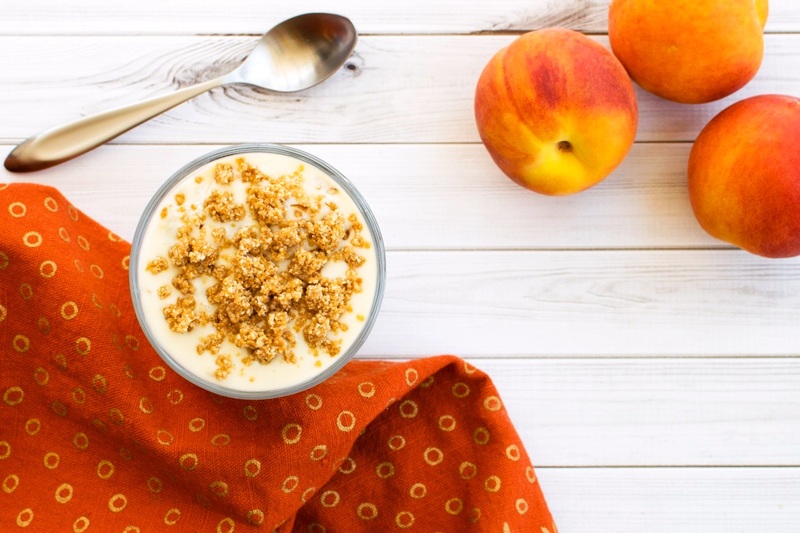 This post is sponsored by Silk, but the peach crisp yogurt parfait and no bake crumble recipes are my own loves. The crumble is adapted from the massively updated Go Dairy Free 2nd Edition, which has about 250 recipes from my kitchen. 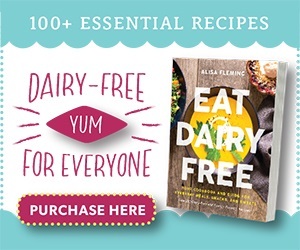 My other cookbook, Eat Dairy Free, has another 110 innovative recipes with full color photos. I picked peaches for this recipe since stone fruit is such a quintessentially summer fruit. However, you can layer on whatever fruit looks best. I’ve enjoyed this no bake crumble with all types of fresh berries, diced apples, and even pears. You can also mix and match your yogurt flavors! I chose Peach Mango to stick with the flavor theme. But for a lower sugar option, you can use Plain. I did stick with coconut sugar, which has a mellow sweetness. You can swap in your favorite granulated sweetener if desired. This crumble topping works well with brown sugar, cane sugar, and maple sugar. I haven’t tried any of the low sugar or sugar free alternatives, but granulated 1:1 options should work well. By ingredients, this recipe is dairy-free / non-dairy, egg-free, gluten-free, grain-free, peanut-free, optionally soy-free, vegan, plant-based, and vegetarian. This super-easy crumble topping sets up in minutes in the freezer. 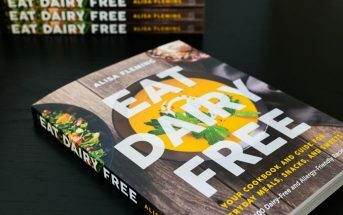 It's adapted from my flagship book, Go Dairy Free: The Guide and Cookbook (2nd Edition). Put the almond flour, sugar, cinnamon, and salt in a medium bowl and whisk to combine. Add the coconut oil and vanilla and whisk until coarse crumbs form. Use 3 tablespoons oil for finer crumbs, 4 tablespoons (1/4 cup) for chunkier, firmer crumbles. If desired, whisk in the sliced almonds. Dump the mixture onto parchment paper, spreading it out a bit, and place it in the freezer for about 10 minutes. Remove the crumble from the freezer and break up any large chunks. Store the mixture in an airtight container or plastic bag in the freezer. 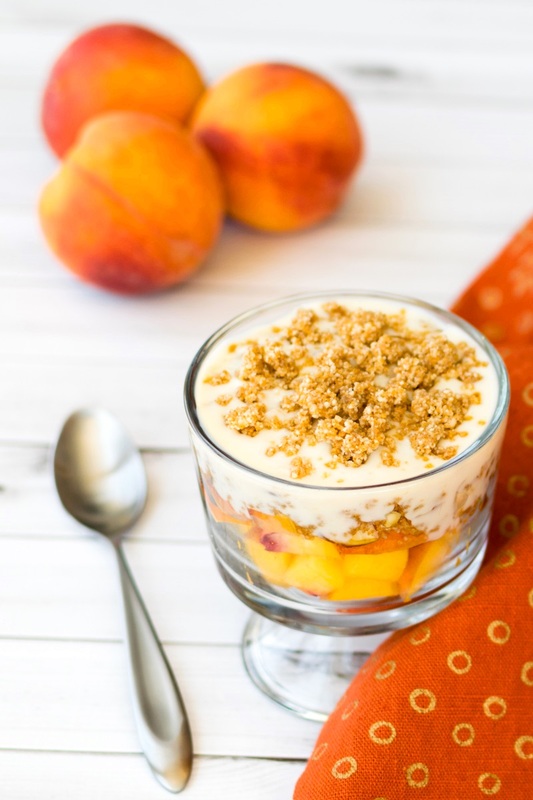 Layer the yogurt, peach, and crumble in a parfait glass or bowl. I like to finish with a little crumble on top. I love this parfait idea! I’ll have to try this the next time we pick some peaches up at the orchard! Do you have any suggestions on what to use instead of almond flour? I love the idea of having a ‘dessert’ for breakfast. You can use quick oats or coarsely ground oats, however, I recommend toasting them first. I haven’t tried this yet with just seeds, but a mix of ground sunflower seed and whole hemp seed kernels might work well. I made a batch with hemp seeds added and it was quite good! Give me all things peaches. Seriously–one of my favorite fruits–and I love the textures in this recipe. Well get ’em while you can Megan! I swear, peach season always seems so dang short. Such a perfect treat for peach season! Can’t get enough of them this time of year! You and me both Jessica! That topping sounds delicious! I love peach everything and I had no idea Silk made yogurts. Will have to check them out. Yes, two full lines now! One is soy-based, one is almond-based. They are seriously popular and for good reason. Top it Tuesday?! Love that idea! I love whipping up no bake crumbles because they are all the flavor in so much less time. What a great recipe! After all these years, it seems we still share a brain… Your peach inspiration is every bit as alluring, simple, and fresh, and yet so very different! Looks like I need to get a whole new stockpile of peaches before the season is out. Right? You always take things to the next level though Hannah! 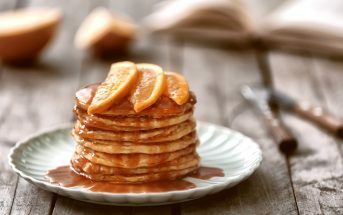 These look delicious, perfect for breakfast or snack. I think it’s the perfect way to use up our ripe juicy peaches! Agreed! Though I must admit, I like my peaches a touch underripe and a wee bit crispy. I’m weird that way! Oh my goodness, that looks mouthwatering. I love the combination and way you’ve used all these delicious things together. Thanks Trinity! I highly recommend the homemade crumble topping – it’s right up your alley! I have a bunch of peaches right now with this all over it! Love how fresh and healthy this is for summer. I’ve been trying to incorporate more DF and grain-free recipes this month and this recipe looks perfect!! 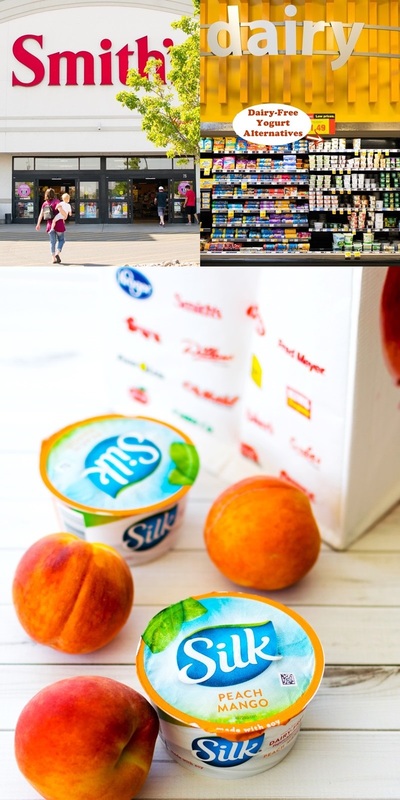 I tried that Silk Peach yogurt last summer at BlogFest and it was so good! Isn’t it awesome? It’s like dessert! I think you would like this one Ashley. Plus, it’s SO easy, you can customize it on the fly! oh I assumed the topping was just granola, but nope you made it even tastier! love the combo, especially over the summer! 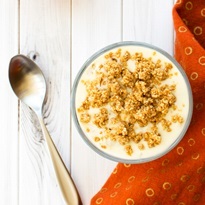 Yes, it’s homemade and no bake – so much easier and faster than granola and a serious treat! I recommend trying it Amanda. Right up your alley I think. I’ve used a little less sweetener, too, with good luck. I am so in love with all things fresh summer peaches right now! 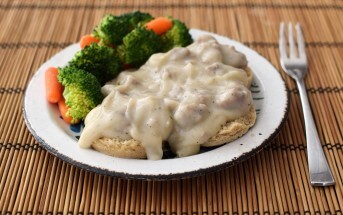 I can’t wait to try this recipe, I love that I won’t have to heat up my kitchen making this! Thanks! Right? I have to fire up the oven soon for cookbook testing, but this gave me a refreshing break before the heat begins! This sounds so good and fresh! Perfect for summer. Going camping this week and might have to get a little fancy with these! Thanks. Yes! Great for travel. I recommend keeping the crisp topping in the cooler though. It’s best served nice and cold since the coconut oil does melt in the heat! This parfait looks delish! Your no bake crumble topping really makes it shine! That crumble topping looks so good! And I’m all about that peach mango yogurt. I know! Whoever thought to first pair peach and mango was genius! This looks so creamy and delicious! And a no bake crumble topping is perfect because who wants to turn on the oven in the summer right?! Would make a great breakfast, dessert, or snack! Totally! It’s customizable for the time of day, fruit on hand, etc.